Cautiously, gently, and without pushing it too hard, I will say that for those who have been waiting for Tim Burton to return to making the kind of quality oddball films that defined his early career, before he became a cheesecake factory of remakes and reboots, you might find yourself pleasantly surprised by Big Eyes. It's no Ed Wood, but after nearly two decades of schlock, be thankful for small favors. Big Eyes is as big-screen biography of Margaret Keane, the painter who grew to fame in the late 1950s for her kitschy paintings of sad children with comically large eyes. Her pictures were beloved by celebrities, praised by Andy Warhol, and derided by "serious" artists. Yet, Margaret never really enjoyed the spotlight, because for years her con-man husband, Walter Keane, took credit for her work. Big Eyes attempts to get at the how's and wherefores behind what happened. The script here is by Scott Alexander and Larry Kareszewski, sort of the go-to scribes for biopics about strange creative types. Their previous credits include the aforementioned Ed Wood as well as the Andy Kaufman portrait Man on the Moon. Burton has tapped Amy Adams (American Hustle) as his Margaret, and Christoph Waltz (Inglourious Basterds) as Walter. His ensemble also includes Danny Huston (American Horror Story), Krysten Ritter (Don't Trust the B...), and Jason Schwartzman (Rushmore). It's a strong cast for a fairly decent script, and Burton packs his period piece with quirky details like Tiki gods and space-age furniture and cool cars. And it all works pretty well. As I said, "fairly decent." Margaret's story is a fascinating one, particularly as she struggles with her creative process, looking for new ways to express herself as her stifling husband almost literally locks her away in a room, forced to churn out more paintings, never to be seen as her own person again. Amy Adams is, as ever, superlative on screen. She lifts the melancholy from Keane's paintings and applies it to the woman herself, never quite shrinking away completely, but otherwise depressed at her own unrealized potential. When it's all said and done, Margaret Keane was a brave woman who rebooted her own life more than once, especially when it meant making things better for her daughter (played at alternate ages by Delaney Raye and Madeleine Arthur). Adams proves you could pretty much watch her do anything and it would be interesting. Not so much for Waltz. Am I the only one who is a little tired of the Christoph Waltz show? I'd say no director outside of Quentin Tarantino knows what to do with the actor, but honestly, I am getting the feeling Waltz himself doesn't really know what to do with other types of parts. His gift for language is well suited for loquacious roles like King Schultz in Django Unchained, but when you take away all that vocabulary, he's not left with very much in his toolbox. He smiles a lot and ingratiates himself as Walter Keane, and I suppose its appropriately phony, but he also gets to rage and bluster and that feels just as fake, if not moreso. There's no soul in his performances. Not in The Green Hornet, nor Water for Elephants. Not in The Zero Theorem. Ironic, then, that this Achilles' heel of his comes clear in a part where no soul is a prerequisite. A lack of soul is what plagues Big Eyes as a whole. Throughout the movie, different characters, including Margaret and Terence Stamp's icy art critic, debate the meaning of art, insisting that expression must come from somewhere deep within the artist herself--which is a big reason that Walter can't keep up the charade. He's only good for empty jiving. I feel the same can be said for Tim Burton. While a cinematic defense of Keane paintings could easily have been transformed into a defense of the filmmaker's own signature style, the direction is oddly detached, as if Burton is only watching from a distance. Big Eyes has nowhere near the level of feeling as the director's best, such as Edward Scissorhands. Rather, it comes across as hollow as Big Eyes' most familiar commercial cousin, the drippy Big Fish. Burton goes through the motions, matching the script's rather broad brushstrokes, but his forgery is about as convincing as Keane's many imitators. It lacks the original spark. 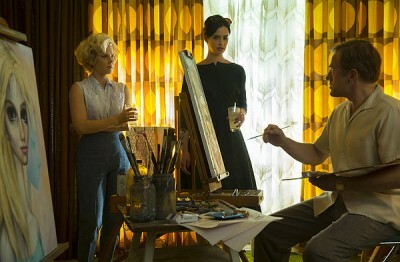 The only time Big Eyes really comes alive and presents us with something unique is actually when it's at its most Burton-esque. There are a couple of brief scenes where Margaret begins to see the people around her as having the same exaggerated eyes as she gives them on canvas. These bits are kind of weird and wonderful and suggest at the vivacious and unique motion picture Big Eyes could have been. A sort of surreal adoption of the subject's point of view, something along the lines of Steven Shainberg's Fur: An Imaginary Portrait of Diane Arbus. Alas, that is something Big Eyes is not; however, what it is is still very much okay. Burton does have a certain panache and adds a nice wink of the eye to his '60s Americana, and while the film does lag at times, one can appreciate the pacing. There is not a lot of fat here, Big Eyes stays pretty lean. Despite the glaring complaints, the movie manages to be okay. Though one can argue if that's good enough--particularly from an artist like Tim Burton whom we hope will one day do better.